The camino is not without its hazards. Some of the pilgrims who have done the Camino de Santiago made comments that the Aussie Camino is every bit as challenging – if not more in parts. The distances are quite long on some days and there aren’t many places to stop. Most pilgrims, no matter how fit or prepared, will feel as though they have been tested at some stage. Nevertheless, at one’s own pace everyone should make it…. eventually. The worst thing that a pilgrim could ask after setting off on Day 1 is ‘I wonder how these shoes will be?’ This means that they haven’t been tried or tested beforehand. Every piece of equipment must be well tested before setting out. Even a 10km walk on a Sunday afternoon around the park a few times reveal problems to do with shoes, pack, water, weight, walking poles, hat, and pants etc. It is important to remember that any minor problem that occurs after 5km will become a major problem after 30km. So it’s important to get out on the track and test out everything you hope to take with you. Each day average, on the camino you will walk 4km per hour but this includes stops. So in training you will walk slightly faster than this. If you aren’t a seasoned walker I would suggest the 4 weeks leading up to the camino over 4 weeks you walk. Each time you should take your full pack. Week 1 – 5 km (1 – hour) twice a week. Week 2 – 10 km ( 2hours) twice a week. Week 4 – 20km (4 hours) twice a week. When on the Aussie Camino you may have a vehicle for back up support, this will mean you will only need to take a day pack. Keep it light. max 4kg – that includes 3L of water. All prospective pilgrims who have not gone on a multi-day walk before must do a 6 hour walk (with short breaks) with all equipment at least once in the training period. 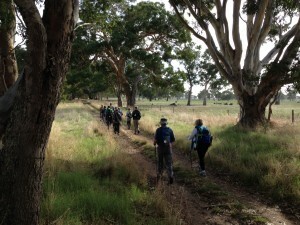 This is the only way to ensure that each pilgrim is fit and capable enough to complete the Aussie Camino.